The Sealyham Terrier was developed in the mid 19th century by Captain John Edwardes in the Haverfordwest region of South Wales. He wanted the ideal working terrier to dig out badgers and fox and to accompany his Otterhounds on the hunt. The breed is named after his family estate. The Sealyham Terrier was recognized by the United Kennel Club in 1919. 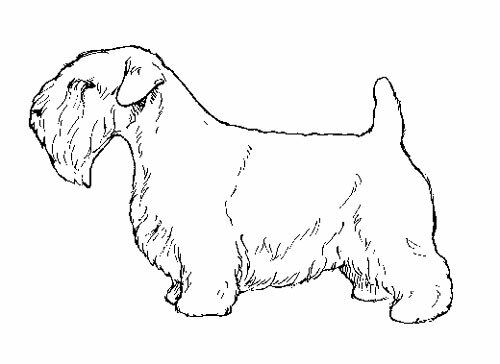 The Sealyham Terrier is a strong, sturdily built, active working Terrier that is oblong in general outline. It has as much substance as possible for a dog that is quick and capable of digging and battling its quarry underground. Keen and alert, the Sealyham Terrier is fearless but has a friendly nature. Long, broad and powerful, the head is in perfect balance with the body. There is a moderate stop. Very slightly domed with good width between the ears. Long and powerful, with flat cheeks and square jaws. A full complement of strong, white teeth meet in a level or scissors bite, with the canines fitting closely together. Medium size, round in shape, set fairly deeply. Very dark in color. Dark pigment of the eye rims is preferred, but lack of pigment is acceptable. Fully pigmented, black in color. The ears are well rounded at the tip and long enough to reach the outer corner of the eye. They are folded level with the top of the head, the forward edge being close to the cheek. The ear leather is thin but of sufficient thickness to avoid vertical creases. Serious Faults: Prick, tulip, rose or hound ears. Long, thick and muscular, clean at the throat. Blends neatly into well-laid shoulders. The well laid back, powerful shoulders are sufficiently wide to permit freedom of action, but are not over muscled. Serious Faults: Upright or straight shoulder placement. The strong, well boned forelegs are as straight as is consistent with a well let down chest. Elbows lie close to the chest. The body is medium length and flexible. The back is level. Chest is deep between the front legs and the ribs are well sprung. The very powerful hindquarters protrude well past the set-on of the tail. Thighs are deep and muscular. Stifle and hock joints are well bent. Rear pasterns are parallel to one another. Round and cat-like, with thick pads. Toes point straight ahead. Set straight off the back and carried upright. Thick with a rounded tip. Customarily docked to a medium length. If natural, the tail should be straight and carried upright, not too far forward over the back. The breed has a weather-resistant double coat. The outer coat is hard and wiry; the undercoat is soft and dense. Serious Faults: Silky or curly coats. All white, or predominately white with lemon, brown, blue or badger markings on the head and/or ears. Serious Faults: Heavy black markings. Ticking on the body. Height should not exceed 12 inches at the shoulder. Ideal weight is approximately 20 pounds for males, 18 pounds for females, but general conformation and type are more important than weight. Movement is sound, strong, quick, free, true and level. Serious Fault: Lack of drive.